SOLOMON AYADO writes on the ongoing probe in Benue State and the seeming frosty relationship between incumbent Governor Samuel Ortom and his immediate predecessor, Gabriel Suswam. The dimension with which the ongoing probe in Benue state is being dragged may fast degenerate into a total political war hence the verbal attacks and skirmishes between the incumbent Governor Samuel Ortom of the ruling All Peoples Congress (APC) and immediate past governor Gabriel Suswam of the opposition Peoples Democratic Party (PDP). Nobody including members of the political class in the agrarian state have had any premonition that the once existed friendly relationship between the incumbent Governor Ortom and his predecessor, Suswam would be covered with frost and their cordiality be devoid of warmth. The towering of their political alliance was very invigorating until the last governorship election when the slant inclined to a bend and their mutual understanding was presented with a bias. The expectation of having an unsettled disagreement between predecessor and successor is no longer news, only the handling of the ugly development can be what would be now be put to test. The reoccurring disharmony between exiting and incoming leaders somewhat depict a payback scenario. In Benue state, the duo of Ortom and Suswam may have no assumption that their cordiality would be pushed to the mud. They were best of friends and had belonged to same political party, the the ruling PDP. Retrospectively, Ortom became the National Auditor of the PDP before he was later appointed as minister of state for trade and investment, and subsequently as supervising minister of aviation, while Suswam was governor of Benue state and one of the closest ally to former president Goodluck Jonathan. It was said that Ortom’s appointments were single-handedly influenced by Suswam whose closeness to Jonathan made the claim very undoubtably. Until his coming to run for the governorship of the richly agricultural state, there was no crack in the relatedness of the buddies. Interestingly, their friendship culminated into a serious family tie between the Suswam’s and Ortom’s. Governor Ortom’s seeming fall-out with Suswam is one development that shocked many political leaders and supporters. During the campaigns, Ortom had addressed all journalists in Benue state and said that Suswam was a jolly good friend he (Ortom) cannot afford to loose simply because of politics. He narrated how Suswam influenced his political and economic growth, noting that his private residence and Oracle business was uplifted through the financial assistance of Suswam. Still, Ortom dumped Suswam and the PDP, shortly after the primaries and defected to the APC. His crisscross was propelled by the fact that he had unexpectedly lost the PDP ticket to Terhemen Tarzoor who, many political pundits believed was Suswam’s favorite candidate. But before the conduct of the PDP primaries, there were varied calls to Ortom from top notch of the APC, urging him to defect and secure ticket under the then opposition platform. This however, was due to the fact that the APC in the state led by former senate minority leader, George Akume was not at home with the candidature of Barrister Emmanuel Jime who was representing Makurdi/Guma federal Constituency in the House of Representatives. Like the rejected corner stone, this was how Ortom dumped PDP and switched to APC, few days to the governorship election and won ticket. Ofcourse, he was quickly granted waver by the party and immediately got nominated as sole candidate for the governorship election. 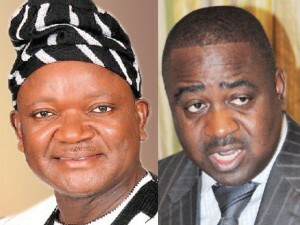 While some analysts pointed accusing fingers on the hate campaign and propaganda melted out by Ortom and his supposed political father, Senator Akume to the administration of Suswam, others posited that the violent pattern of opposition at the time was the major reason that forced Suswam not to witness the swearing in ceremony but to flee the state barely 12 hours to Ortom’s inauguration. But assuring of his cordiality and cooperation, Suswam had few days to the inauguration of Ortom, donated to him assorted brands of SUV Prado and Lexus vehicles to enhance transportation. During the formal presentation of the vehicles in government house Makurdi, Suswam explained that the donation was not in anyway a trap but normal ritual hence, according to him, his predecessor Akume did same to him while he assumed office as governor in 2007. He further requested Ortom to beckon on him any time there was need to offer explanations on state issues. To further show clearly that the relationship between Suswam and Ortom was deeply sinking into muddy waters, disagreement ensued between the duo, over the actual debt profile of the agrarian state. Suswam claimed to have handed over N9 billion owed debt but Ortom debunked, described it as a blatant lie and stated that preliminary investigation by the transition committee had revealed about N130 billion actual debt profile. “The Mike Iordye led transition committee discovered that as at the time the administration of Ortom took over, arrears of pensions and gratuities stood at over N16.7 billion, arrears of salaries was over N9.5billion while contractual obligation was N72.03 billion.It said commercial bank loans stood at N11.129 billion, CBN loans N585 million, state revenue bond N9.694, foreign loans N9.818 billion with judgement debts standing at N1.236 billion totaling over N130 billion.” Ortom stated. Also, wether it is a vendetta tactic or any vindictive move, Ortom had quickly upturned all the last minutes actions of his predecessor including the appointment of first class chiefs of the Tiv Chiefdom. But more worrisome is the recent chase out of Suswam from a residence located in the highbrow Lobi quarters Makurdi which he claimed to have bought from state government, several years ago. The assets recovery panel in conjunction with a Makurdi High Court revoked the purchase of the property, saying the procurement did not follow due process. Considerably, the inability of the political leader, George Akume to bring together the disagreed former governors with the aim of amicably sorting out the lingering financial issues of the state has nearly depicted a gang up. This is even as Suswam has categorically refused to surrender to probe on claims that it was a witch-hunt and that the process is skewed hence it was not extended to his predecessor, Akume. Recently, Ortom has while fielding questions from newsmen in Makurdi, explained that 52 names of past government officials, led by Suswam, were released by the judicial commission to refund some looted funds. He stated that he (Ortom) will soon hand other the accused persons to the EFCC and ICPC for prosecution and onward recovery of the stolen monies. But Suswam has maintained that the probe cannot hold waters hence it was not genuinely constituted and with every bias. In whatever manner or whichever way the probe would proceed and finally end, the real intention of Governor Ortom may soon be pictured in a nearby future, just as the people will see clearer wether Suswam can escape the hook and or refund the alleged diverted funds. But wether the duo are masterly playing politics with the probe, only time shall tell.